In the recent Mother’s Day episode, the Yu•Me is shown when father Mike Heck (Neil Flynn) shops for a gift for his wife, Frankie (Patricia Heaton). It is the second television appearance for an Inada massage chair. The Inada Sogno DreamWave™ played an ongoing role for the 2009 season of NBC’s Emmy Award-winning “30 Rock” as character Tracy Jordan’s (Tracy Morgan) personal massage chair. The Yu•Me rocking has a starring role in thousands of homes around the world as a massage chair that faithfully replicates shiatsu master manipulations, using Inada’s proprietary Rotary Rocker Technology. The Yu•Me’s proprietary body scan personalizes the massage session based on shiatsu points, while the proprietary neck stretch pillow provides shiatsu-style acupressure that closely mirrors the movements and sensations of a skilled massage therapist. The chair also features Thera-Eliptical-Kneading (TEK) that massages the user’s calves by simultaneously providing compression and rotation. Color Kinetic LEDs, located in the chair’s foot rest, provide a visually relaxing ambiance to the room where it is being used. Designed by world-renowned Toshiyuki Kita—a 2009 Pinnacle Award finalist for his Inada Sogno DreamWave™ massage chair design—the Yu•Me rocking massage chair perfectly blends Eastern medicine and modern technology into one perfect, and amazingly relaxing package. 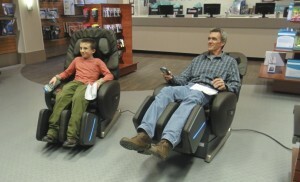 To learn more about the Yu•Me rocking massage chair or to find an authorized Inada dealer, visit www.InadaUSA.com.